- Double locking snap hook (Big Hook 21cm(8.3") Long), high strength and toughness. 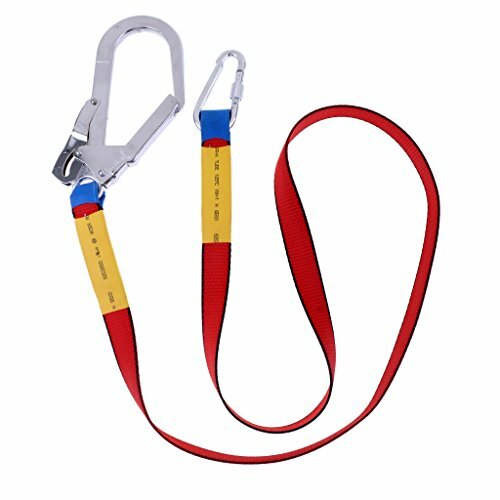 - This lanyard is designed to reduce the risk of falling and slipping. You can easily maneuver around obstacles and obstructions while remaining attached. - Suitable for construction, climbing, arborists, logging, inspection, emergency and rescue services, roofing, welding, military, and other professional workplaces that require safety and fall protection. Double locking snap hook (Big Hook 21cm(8.3") Long), high strength and toughness. This lanyard is designed to reduce the risk of falling and slipping. You can easily maneuver around obstacles and obstructions while remaining attached. Suitable for construction, climbing, arborists, logging, inspection, emergency and rescue services, roofing, welding, military, and other professional workplaces that require safety and fall protection.